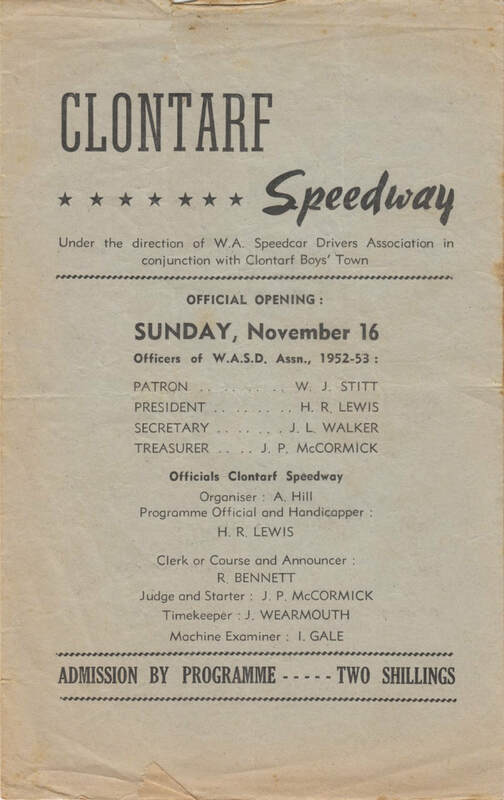 Clontarf Speedway officially opened on the 16th of November 1952 under the direction of the West Australian Speedcar Drivers Club and in conjunction with Clontarf Boys Town. Speedcar racing will be held on Clontarf's new track this afternoon. Also on the Clontarf gymkhana will be novelty horse events and log chopping. Buses leave the old GPO at 1.45 and 2.15 pm. 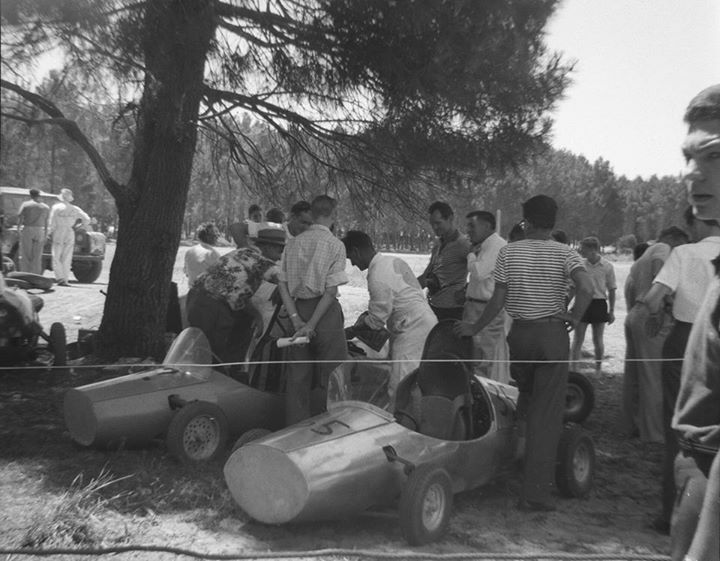 The Perth tq Car Club was formed in 1956 the inaugural committee consisted of Col Phillipson as President, Ed Pilkington as secretary and Peter Huitinga as treasurer with Wally Higgs taking on the social directors position. 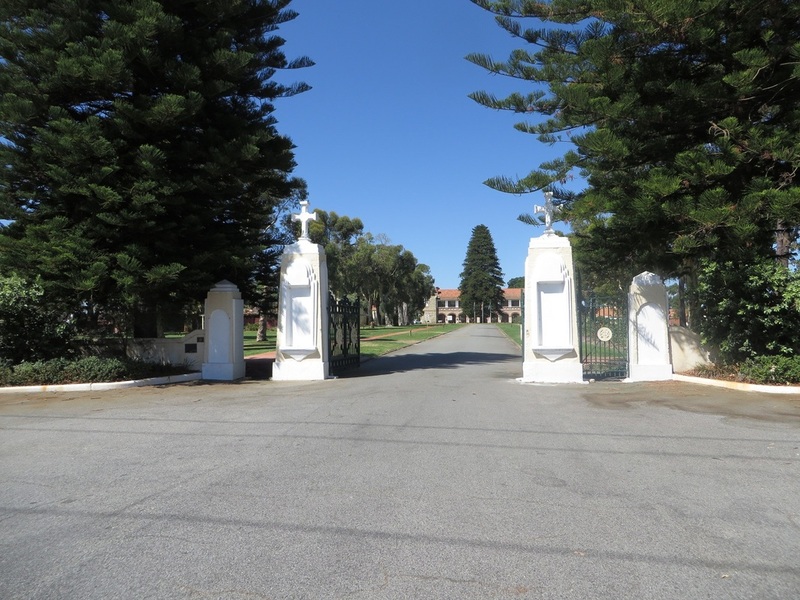 The club initially ran around the houses events in conjuction with the Coastal Motorcycle Club at Halls Head Mandurah, this led to more meetings being held in many country towns such as Beverley, Burracoppin, Kellerberrin, Katanning, Kojonup, Narrogin, northam, Merredin and Wagin. In 1963 the club phurchased land near Jandakot airport and built another track but this area was prone to continues flooding and in 1967 the site was flooded beyond repair so a new track was built in Bibra Lake, this being the venue that the club opperated from June of 1969 up untill 2004 when the track was closed to make way for mining. TQ racing is likely to become a popular car sport in WA in the near future (TQ stands for three quarter midgets. TQ's are basically three quarters the size of the American midget or Australian speedcar, they are powered by 500cc overhead valve motorcycle engine, Many speedway stars are becoming enthusiasts, among them are solo champion "Chum" Taylor, sidecar stars Tom McQuade and Arthur Hurst, road racing champions Peter Nicol and Dave Fletcher, American speedcar driver Bob Lichtenberger and unlucky Mobilgas trial competitor Don Plunkett, In Adelaide where TQ racing was first introduced by the Racing Drivers Association of SA, there are now more than a dozen machines already built, at least six have been appearing in race programs for over a year. First one: A small group of enthusiasts is building the first TQ in Perth, Cost of building a TQ is very low as most of the work can be done by anyone with rudimentary mechanical knowledge, Parts most commonly used are Austin seven front and rear axels and springs, both axels are within the specifications laid down, Wheels and tyres must be no larger than 16 by 4.50, or simular to the wheelbarrow pneumatic version of16 by 4.40 dimension, Brakes are essential on rear wheels only but four wheel brakes can be fitted by using Austin parts, Choice of front or rear engine positioning is left to the constructors discretion, The orthodox motorcycle features including chain drive may be followed, so leaving the driver's compartment free of a propeller shaft tunnel. Roll over bar: Body shapes vary both in type and shape and construction but most give reasonable protection to the driver and a roll over bar is an essential, A well constructed model could quite easily be used as a duel role as demonstrated recently at Collingrove Hill, SA, WHERE a TQ despite being very much over geared and with only one gear anyway, made faster time than most saloons which had much greater capacity and gears to choose at will, Interested enthusiasts who require plans can get in touch with the TQ club at 37 Aberdare Rd Shenton Park. Top Right : Peter Nicol who won his fifth Harley Scramble last Sunday tries out the TQ car, at left is Clem Dwyer who holds five Australian motorcycle records, Ted Murphy who built the car is standing at the rear. 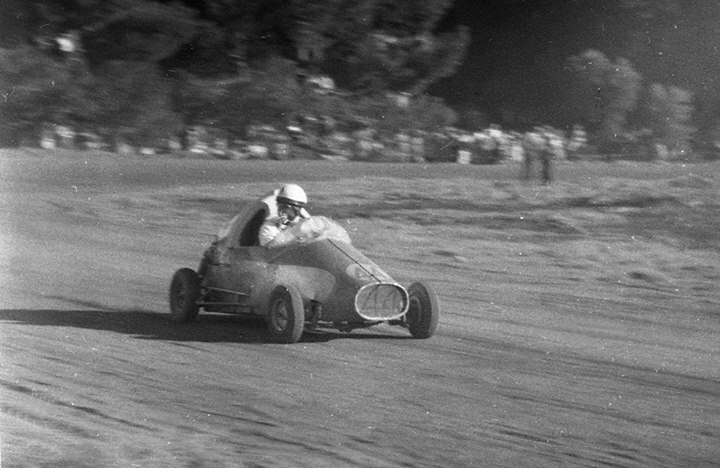 1957 - Doug Whitehead in the number 4 car ripping up the dirt at the new Clontarf Speedway. Photos: Nola Whitehead. Les Sharpe recalls: In the drivers photo above I picked out Bill Broadwood, centre of the front row just behind the driver lying down,He was a great driver and owned a Neptune Service Station in the Canning area just over the Canning Bridge, A man who enjoyed a beer as much as anyone did. 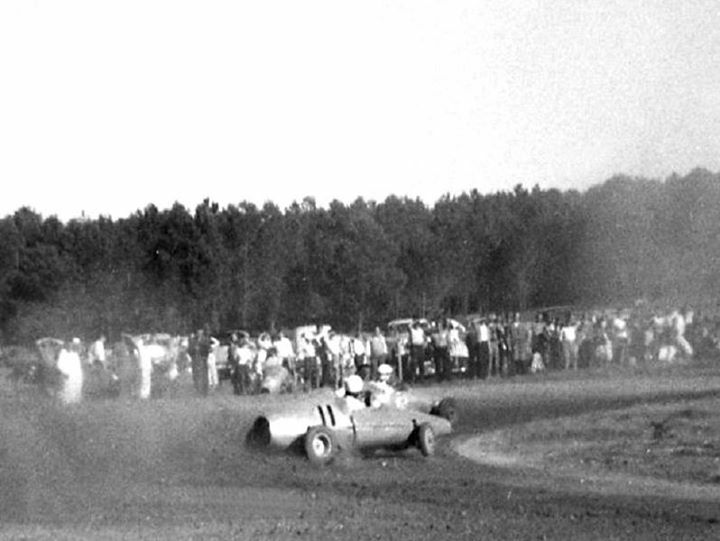 1961 - Ossie Wolf's sitting in his number 8 car. Photo: Adrian Clements. 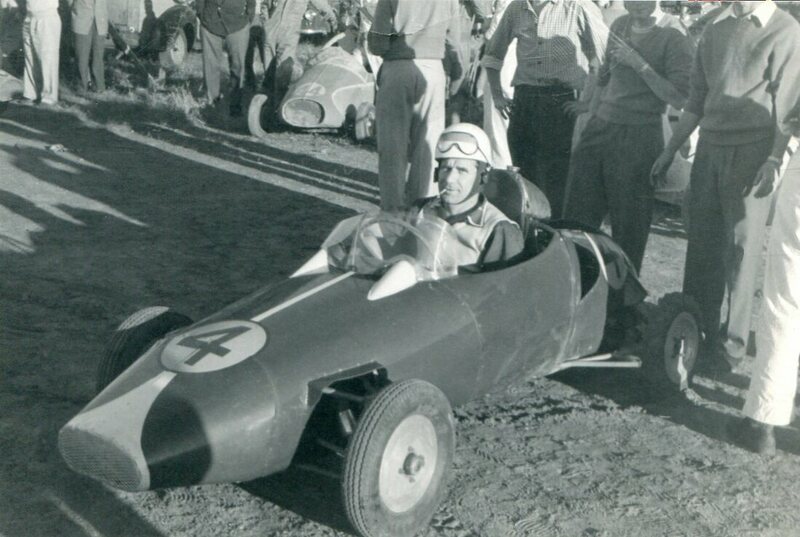 1961 - Adrian Clements sits in State Champion Noel Potts number 23 car. Photo: Adrian Clements. 1961 - Ossie Wolf sitting in Noel Potts machine. Photo: Adrian Clements. 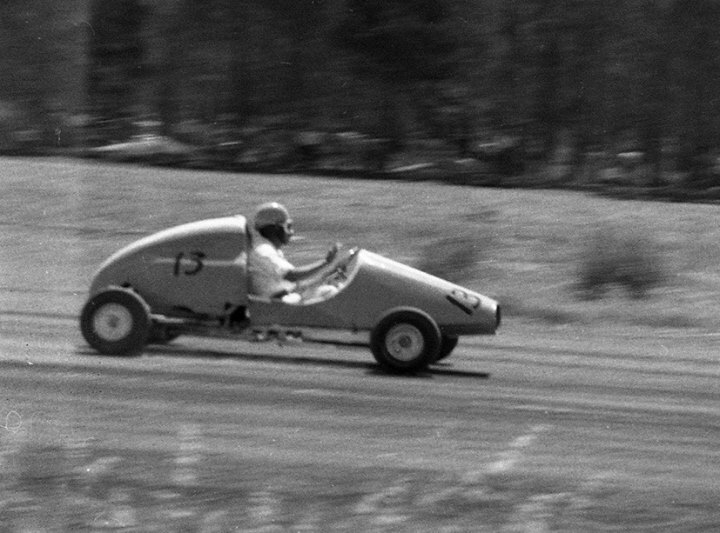 1961 - Doug Whitehead finished 3rd then Wally Higgs for 2nd and Noel Potts was the winner of the 61 Championship Photo: Nola Whitehead collection. Ken Devine Clontarf track Feature. 1963 George Higgs leads Hilton McGee in a race for line honours. Photo: unknown. 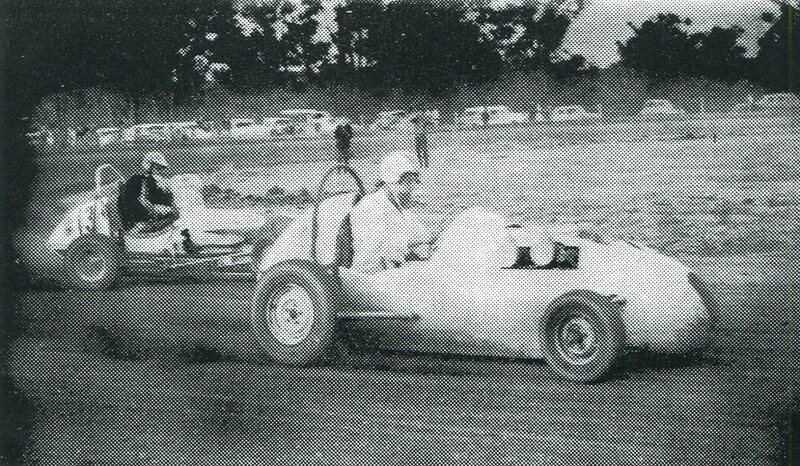 1963 Current Claremont Speedway champion in the pits at Clontarf. Photo: unknown. If you stand in the gateway at Clontaft College and look straight across the road, you are looking at the former Speedway location. 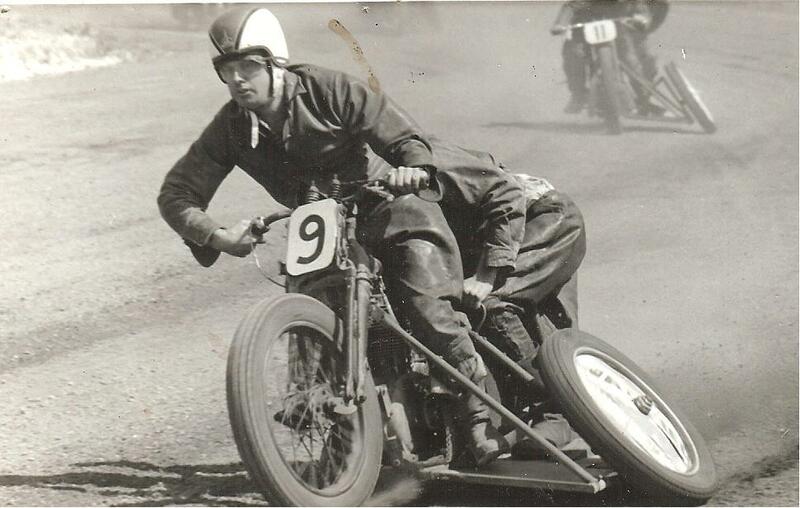 Harry Taylor raced a Triumph sidecar at the Bibra Lake circuit during the 1965 season, The Triumph was well suited to the Bibra Lake circuit and it wasn't long before Harry Taylor was established as the number one sidecar rider at the track. He achieved a win rate of some ninety seven firsts out of ninety nine starts and two seconds over the two seasons. 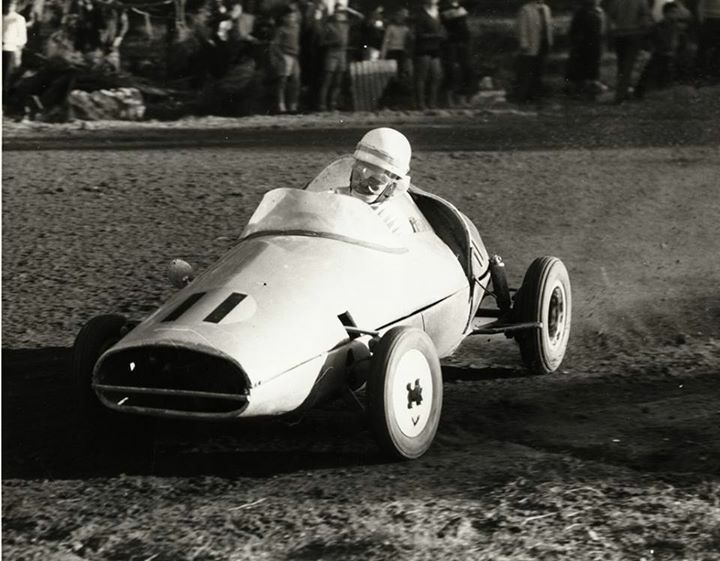 In addition Harry broke the track record many times, This success over the two seasons was instrumental in him returning to the big Claremont Speedway, As for Bibra Lake, Harry used the track as a training track in the off season. 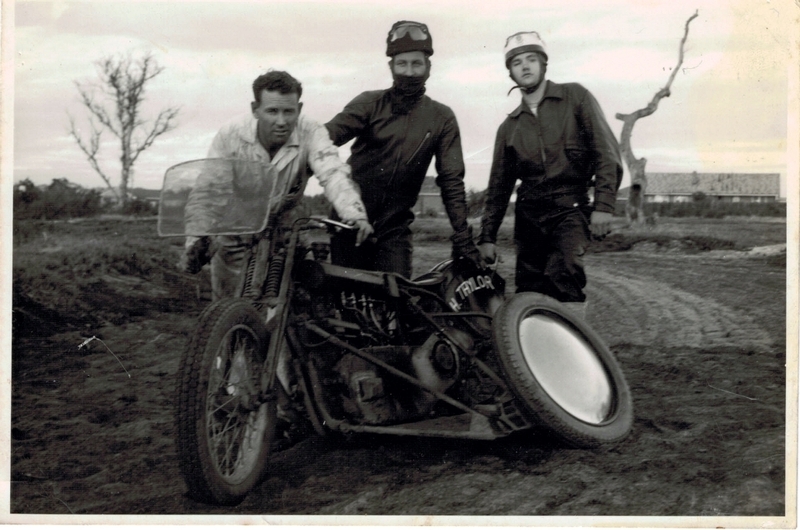 Ralphy Taylor recalls: One meeting at Bibra Lake Speedway the old man Harry was racing sidecars, during one of his races he came together with another outfit and ended up over the fence and into the crowd, I asked Harry after that, why do you ride these things, he said, muscle's, guts and no brains son. Les Sharpe recalls: George Higgs built and only raced this outfit for a short time and handed over the riding duties to my uncle Charlie Johnston who painted it in all white colours, I Also swung for Charlie on many occasions. With flooding problems caused by the development work at the nearby airport, The Perth tq Car Club was forced to shut down the track that they owned and move there racing events to the Wattle Grove venue. As luck would have, The now useless piece of land that was the previous speedway, that everyone thought the club was stuck with became a target for the government to buy back, so a price was negotiated and the land was on sold. 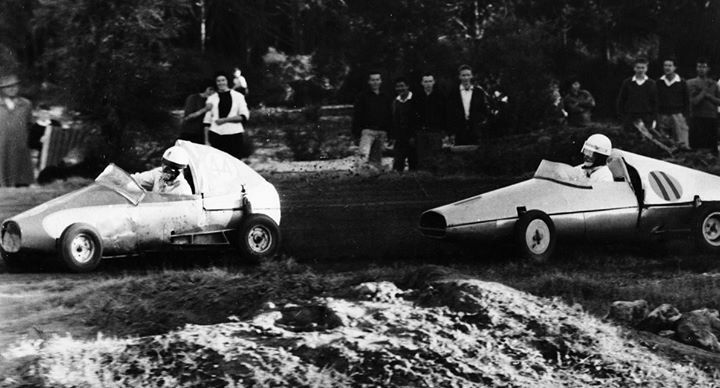 By 1969 the new venue was completed, The club finished racing at Wattle Grove and the gates were opened. Once again the smell of methanol, (Wot No Nitro) the crackle of Japs and Eso's the helmeted leather clad figures with steel boot soles sending sparks flying from the contact with iron pyrites embedded in the dirt is the picture for the next meeting at Bibra Lake Speedway, This will be on June 29, almost two years to the day when they were last in action on the seaside track. so long since this was so a little past history must be explained, Two years ago the old Bibra Lake track was flooded beyond raceworthiness and the programme for that year continued, by kind permission of the RDA on the Wattle Grove circuit on Saturday afternoons. 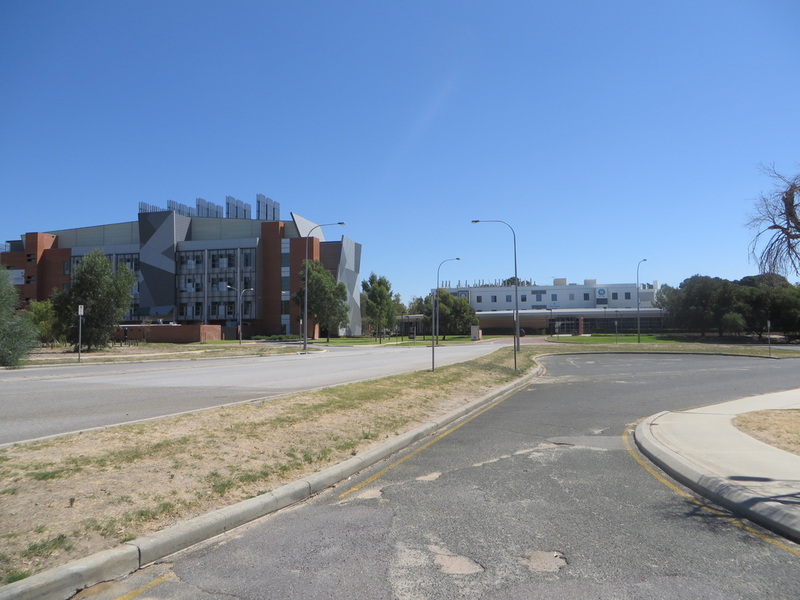 The present headquarters of the Perth TQ Car Club was opened in June of this year and great were the plans for this site, Hovever resumption by the C of A for the extensions of Jandakot Airport swept plans aside. To put money into fencing would be lost money under this set-up but a new international has made it possible for the Speedway Control Board to view the the circuit in a differant light and so a trial day has been arranged in order to bring the solo's back to winter speedway as so many of the competitors in this branch would want. If last years solo brigade increases for this season it may be neccesary to run 2 novice events at the beginning of the programme. Promotors and solo officials agree that the paying customer must be looked after and given what he wants - good racing, Of the crop of young rider, less experienced riders only 4 can qualify for starts later in the programme. This points back to just how popular solo racing could be at Bibra Lake if an agreement can be reached between the SCB and the Perth tq Car Club because it will be here that many potential greats will gain a lot of there inittiation. At the moment of going to press it is known that Nipper Neil, Peter Ward, Des Noble, Gerry Bridson, Abe (4x2) Schnider and Hec Haslinger will be appearing with the possibility of two of the big guns being seen on the ground. 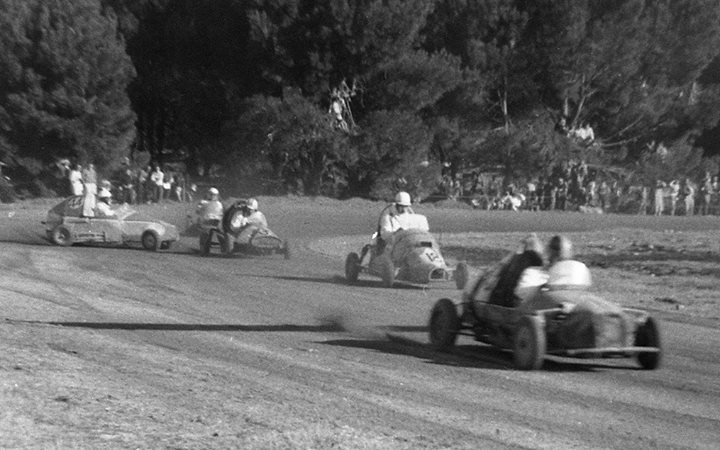 This meeting will be only a demonstration run which limits the number of starters to four, The purpose of such meeting is to enable Speedway Control Board officials to assess the safety margin of a particulat track, For example the Speedway Royal in Sydney and Rowley Park in South Australia are only permitted to run four starters in a scratch event and six in a ahandicap event, Claremont Speedway is allowed to start six in a scratch and eight in handicaps. Another requirement for the promoting body is to ensure, in writing, that riders insurance is equal to that of the SCB standards. 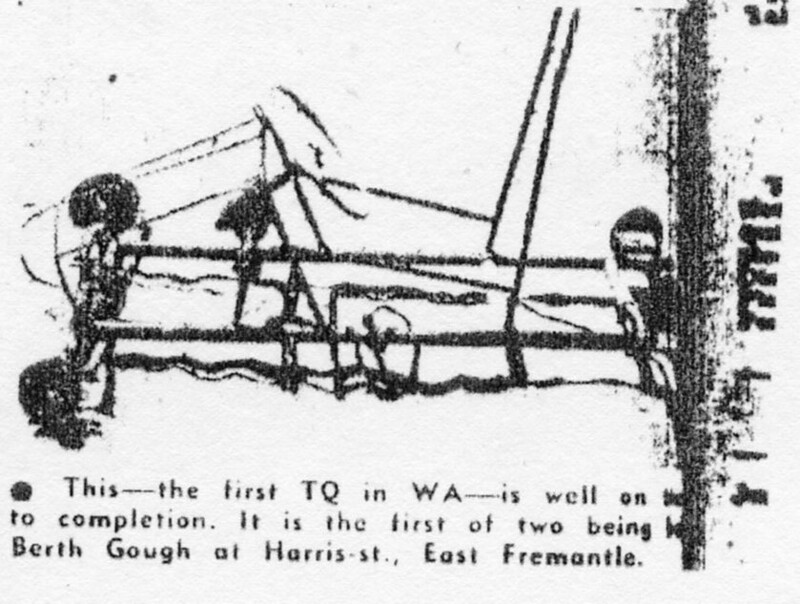 1985 HISTORY OF THE PERTH T.Q CAR CLUB INC.
Our Club was formed after a newspaper article from Victoria told a story of a working man's racing car, Someone from Perth advertised in the local paper for interested persons and the news got around and eight or nine tq's (three quarter midget speedcars) got underway. It was then arranged to have a meeting and start a club, The meeting place was Bunny Burrowes wine shop in Subiaco in 1956, Col Phillipson was the inaugural President, Some of those attending were Bunny, Charlie Hawkins (first life member, now deceased), Wally Higgs, Peter Huitenga, Bill Richards, Alf Richards. The first secretary was John Anderson's farther in law Ed Pilkington and Peter Huitunga was treasurer with Wally Higgs as social secretary. Race number 1: Our first race meeting was at mandurah, a road race in conjunction with the Coastal Motor Cycle Club, This was somewhat of a disaster as these machines of anything one could get his hands on, I recall getting lost after a slow start and pulled up to what I thought was a bunch of spectators and asked which way they went, they shrugged their shoulders, I drove back to the waterfront (starting line) and when they came around the corner I joined them for a few laps anyway, 7 started and 2 finished. Soon after, Club's popped up everywhere, Albany being far the strongest, In those days it was all road racing, and believe me a lot of fun and lauughs, We applied then to Aub Lawson for a run at Claremont and we were known as the flying fleas, In disgust the club wrote to Lawson complaining and he refrained from calling then such, We went off to many country towns to race, Narrogin, Wagin, Kojonup, Katanning, Beverley, Northam, Kellerberrin, Narrembeen, Merriden, Burracoppin and so on, but some dirt racing tracks were now starting. 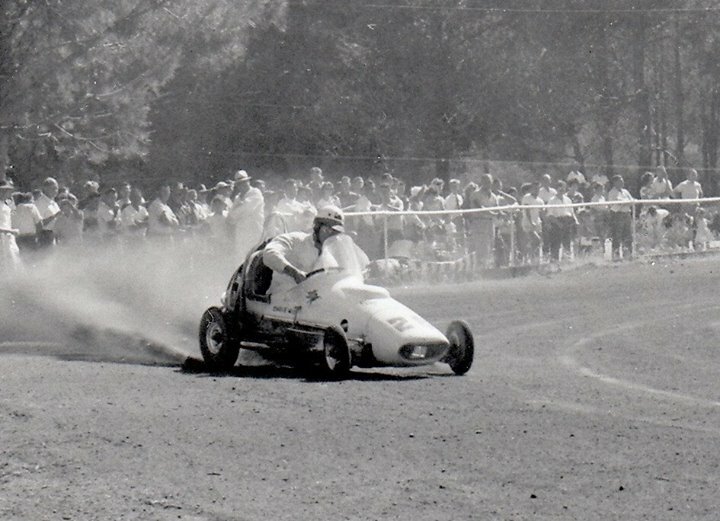 I originally built a track (using Council machinary) at Clontarf Orphanage for the WA Speedcar Club, After a couple of winter seasons they abandoned it and the Perth tq Car Club applied through Bunny, and got the use of it, paying 50% of the gate takings to Clontarf, We put in three or four successful seasons there, We were now meeting monthly at Cambridge Street Wembley and although paying out a lot of our gate, the club, through Socials mainly, amassed the amount of one thousand, one hundred pounds, there was lots of discussion on the best paying bank, Society or such to invest in, My idea was land but they had Clontarf and were very happy, However, I was allways looking for land and even in those days Speedway was taboo, It was Eugene Edwardes, Shire Clerk of Cockburn, who told me to look around the Jandakot Airport area as this was, in his opinion, the only place to go as the noise would not be a problem and he would push for a permit, And so he did, A land sale had just gone through there and luck had it that a a block was forfeited and we could negotiate with the agent for time payment. Annual elections coming up and I had been nominated among others for President, I quickly moved round and sighted a grader and Austin Truck, I was elected President and my first meeting went beyond midnight, After getting the members to agree to a deposit on the land Ithen put up to purchase the Grader and truck and this was accepted and hence the eleven hundred pounds spent and the end of our investment problems. In the meantime I was Speedway rep, and the tq boys had a disagreement with Lawson and we were not racing at Claremont, This went on for a long time and our club membership was falling, I endavoured to console members on the fact that those left were the good ones and we would get our track finished and all would be well, As so it was , The little Austin truck worked nights and weekends, as did small contractors and truckies, and a handful of members and their wives and families, and our first track opened on the 6th of October 1963, Three meetings were held. The next season saw things really move, The membership quickly went to 200 and lots of tq's came to light, I might add the entry fee to the speedway was two and sixpence, The first Bibra Lake Chamionship was won and I was the winner from Stan McEntee, I was also the winner of the coverted Coventry's KLG Spark Plug Trophy, Our club built the first grandstand in the shire of Cockburn. 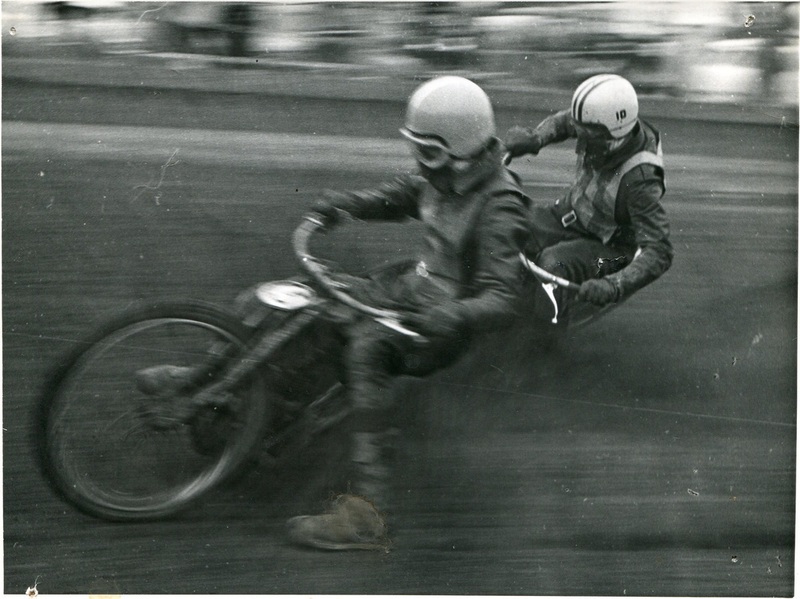 It was then decided to have solos and sidecars, We had one or two meetings using Claremont riders and drew good crowds, but had the usual problems with theirAssociation which Lawson had a big say in, However we decided to build our own solos. up sported twelve starters, one a girl This opened the eyes of the speedway riders and I was elected to the Speedway Control Board and that section was off. We then decided to build sidecars, Amoung others five were built at my workshop, and away went the sidecar teams. Some of these riders were Ossie Wolfe (deceased), Warren Harrison, Harry Taylor and myself. 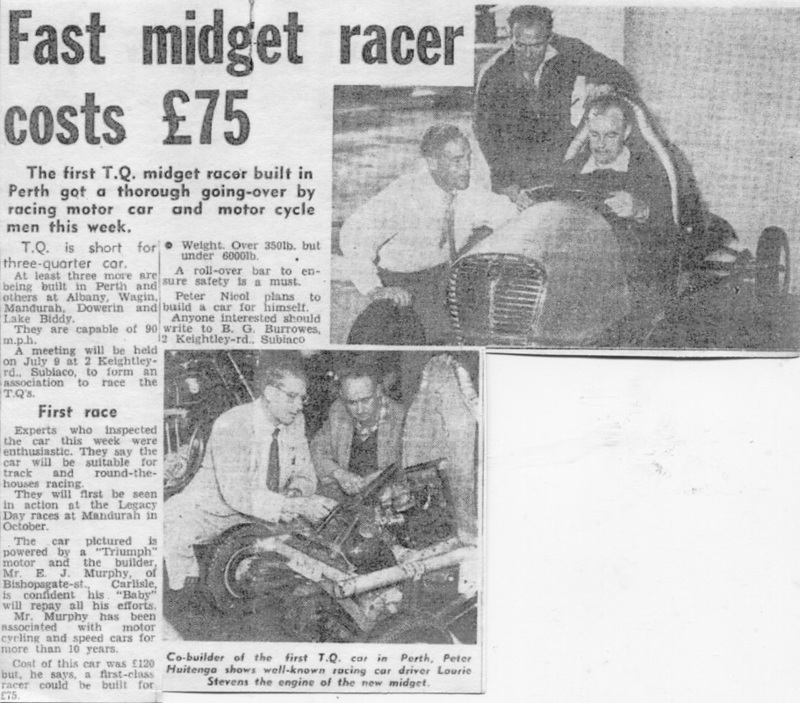 had a series of cooked up match races, Higgs v Higgs, Soon this attracted some of the Speedcar boys and that section went reasonably well, By 1965 the show was really on, with some of us competing in almost every event on the programme, Oh to be young. However problems started and with major developments at the airport, large drainage systems etc, We became subject to flooding and although we built the track and road up two feet of water finally took over. This is where a new story starts, We needed to go somewere, but where, The only piece of land left is a big hill, in fact larger than that now on either side, This land was a deceased estate and no will had been left and the beneficiaries were all over the world. The situation was in the hands of the Public Trustees and the only document was a family tree, The situation had been in their hands for four years and nothing had been done, I insisted that we have the opportunity to buy this land and so they decided that if I solved the riddle and negotiated a price with the beneficiaries then we could have it, otherwise it constituted, when organised an Auction, After three or four months corresponding all over the world and Australia we won the right to buy. A contact was made with pioneer Concrete to supply concrete sand using our own machinery, Peter Gordon and myself raised the finances to put the necessary machinery into action. There were conciderable complaints that Peter and I were to make a quid, all we got was grey hair. 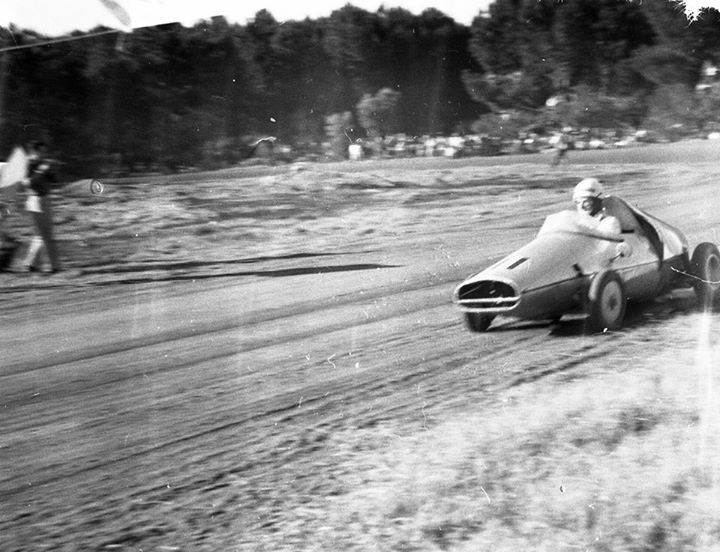 In the meantime the Club raced at Wattle Grove, Eventually enough sand was excavated to form a small circuit, a canteen and toilets were built and racing commenced once again on our own land. Excavation carried on, sand was sold, givern away, anything to remove that mountain, Things were starting to look good after four years, The Land Committee took assessment of the situation and it was estimated that only about 5000 tons were left to excavate and that there was room left at the bottom of the property to dispose of this amount, The Pioneer contract came up for renewal and we let it lapse. At this point in time a letter was forwarded to me from the Dept of the interior requesting the purchase of our land holding and asking for an appointment date, A meeting between myself and the chief of their department was held, After studying maps of their intensions it was positive that the old property, if not negotiated would be resumed, We had no use for this now swamp land and the sale was a blessing, the money was needed to complete the hill site, I informed the department that the hill could not be sold as that was the only place available for speedway and the reasons were accepted, However the club decided to sell this land (where we are now situated) and possibly get something better suited. In the meantime competition carried on around the small circuit, the property being leased now from the Government, After about six years there was no programme in any direction although there were many approaches made to buy our own land, Speedway is categorised as a noxious trade and so I approached the powers to be on various occasions with the view of spending the interest on the clubs investment, which bring back into memory the old members and workers and the eleven hundred pounds. It was decided by the President, then Wally Cowie, that provided I orginised the work, modifications would be carried out on the existing land and some $15,000 was spent bringing the site up toward what the older members had set out to do. Last year after many enquiries from drivers of different sections, it was decided to once again do a modification to the circuit, This has been carried out and the drivers in general have signified their satisfaction in this regard, And now it seems a new chapter is about to begin. Blind courage . . .
What you cant see cant hurt you, giggled Wendy Dawson 30 who had been blind since her teenage years. Jenny her friends Ryan and Frankand seven others who live in a world of darkness have made up for their lack of vision with courage, last Sunday they became perhaps the first team of blind speedway drivers to hit the dust. Along side them were celebrity navigators whose job it was to verbally "steer". 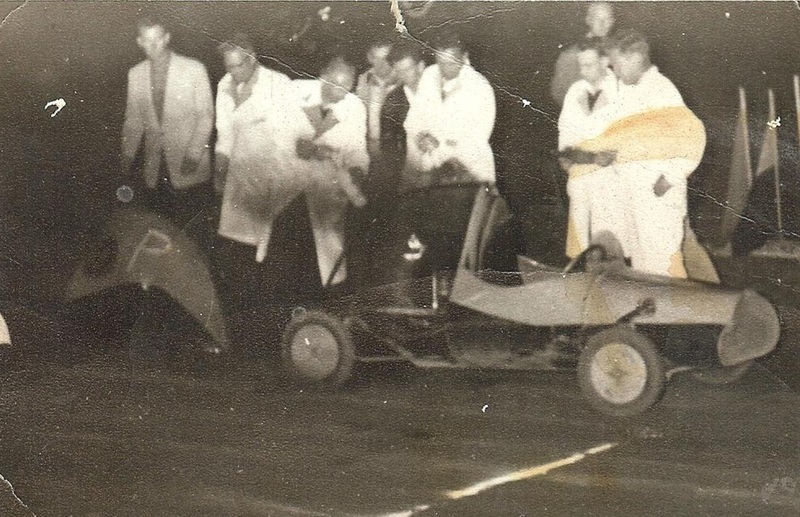 Frank Astone passes on his newly-acquired experience as the next driver, Rob McKrill prepares to go out with sighted ex-speedway driver Rob Post. When TV's Jeff Newman and journalist Len Findlay came to grief in their respective cars one was heard to yell irately "Whats the matter with you - are you blind. A souped up station wagon was all revved up to take blind farther Frank Astone on a test run at Bibra Lake Speedway. But blind teenager Ryan Honschooten , who is studying at TAFE and works for Information Radio, won out on the day. the event raised funds for the Association for the blind and the Variety Club. 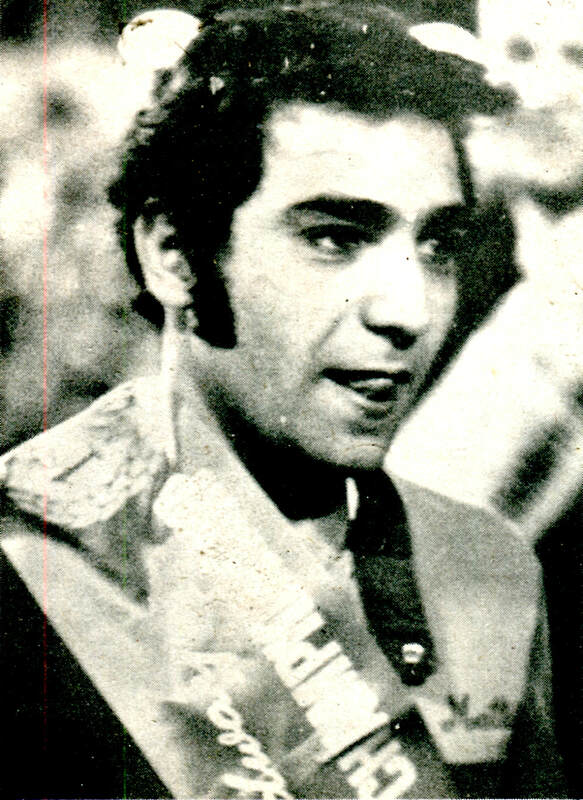 AB: I moved to Perth in the mid seventy's, married, had kids and joined the Bibra Lake Speedway and of coarse friday night was speedway night at Claremont, saturday became trips to Bunbury, Collie and Waroona. BM: Unfinished business in Sydney Allan. AB: Another four years back home in Sydney and small write ups started to appear in Speedway publications, over the years I wrote for Speedway Star (Aust), Speedway West, Speedway Illustrated, Peter Whites Speedway World and the glossy covered Chequered Flag magazine. BM: So when did you move back to Perth. 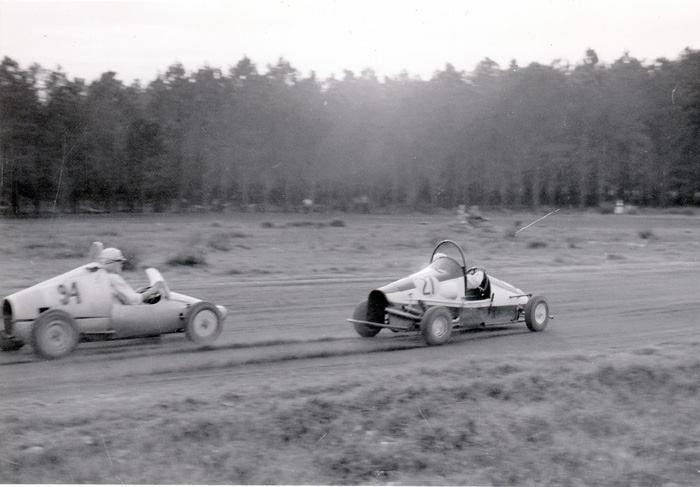 AB: I moved back to Perth in the mid eighty's, back to Bibra Lake Speedway and the off season working bee's to extend the track. after a while I joined Jerry Wilcox in the pa box calling races, I also called races with Jim Kirkwood, the late Tom Green and Peter Wesso Weston at Ellenbrook. Iv'e called them at Darkan, Narrogin, Moora, Southern Cross and others. At the same time I was writing for Oval Track but had reversed my name and used BJ Allan because the editor didn't want his writers being associated with other publications. It was at this time I was also on radio every saturday morning with Ken Brown and John Cardy at 6NR (now Curtin FM). BM: When and why was West Coast Speedway magazine born. AB: Speedway Speedway Speedway, all for someone else, what about me. I decided to publish my own magazine. Now firmly settled on the west coast in July of 1995 the first ever West Coast Speedway News hit the news stands. BM: West Coast Speedway shut shop Allan what happened. AB: Again Speedway Speedway Speedway, something had to give and it did, one failed marraige and years of financial hardship followed, six years later a second failed marraige and in the years to follow, health problems and a stroke, so when the doctor says slow down what does one do. Speedway Speedway Speedway, Ia'm in my late fifty's now and still around doing freelance speedway media. I to are also researching Ghost Tracks of WA and can be contacted on facebook.